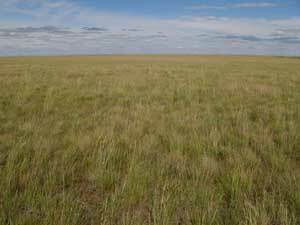 The last few days of the trip we spent on the steppe near Astana. Before we left the hotel in Almaty we had recorded two new species for the trip: Ring-necked Pheasant and Hooded Crow. 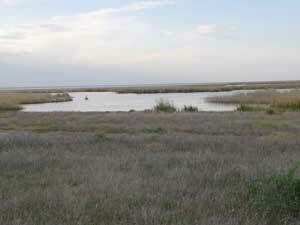 We stayed in the Kurgalgin Nature Reserve, an area of lakes and steppe grassland. There really aren't many natural trees in the steppe so at a roadside plantation, we were pleased to see Red-footed Falcons. 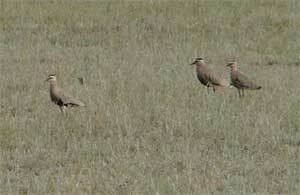 Carrying on, we soon began to see our first Black Larks and of course, stopped for them. As we watched more male Black Larks feeding by the roadside of this remarkably flat land, we checked an adjacent green area and although we couldn't see any water, it was obviously a marsh as White-winged Terns were abundant and nesting here together with Black-tailed Godwits and Marsh Sandpipers. Garganey swam through what looked like grass and our first Black-winged Pratincoles were seen together with Sykes's Yellow Wagtails and Citrine Wagtails. The ‘yellow-legged' type gulls here were all Steppe Gulls (subtly different from the Caspian Gulls we had been watching previously) and we found a vulpinus Steppe Buzzard. A stop at a large lake was very productive with Twite of the steppe form being a good bird to find and we also saw our first Northern Wheatears. The lakeshore held numerous Common Black-headed and Steppe Gulls, a few Common Gulls and five Slender-billed Gulls. Waders included Little Ringed Plover, four Little Stints, two Curlew Sandpipers, a Wood Sandpiper, two Marsh Sandpipers, and many (although only a few were close) Red-necked Phalaropes. A mile or so on we stopped for a large raptor on a telegraph pole and added a magnificent White-tailed Eagle to the list. That evening after checking into our pleasant lakeside cottages, we saw reeling Savi's Warbler, a very pale race of Bearded Parrotbill, Paddyfield Warblers and 'Caspian' Reed-warblers. Our base for three nights was on the shore of the largest lake of the area. We were now deep in the reserve, a place no other tour company visits, and we in the hands of a knowledgeable local guide, Alexei. We began the day with Savi's Warblers reeling then headed to check some nearby smaller lakes. The first one held at least two pairs of White-headed Ducks along with Tufted Duck and Common Pochard. A pair of Red-necked Grebes was seen here plus 31 Whooper Swans, two Great Black-headed Gulls, hundreds of Great Cormorants (seen in large skeins throughout the days we were in the area) and Isabelline Shrike. We also saw the incognita race of Common Reed Bunting, with a smaller bill than the southern birds and a huge nape area. An area of bushes with a few small trees was our next stop. Here a pair of pallidus Merlins were nesting – very pale, small, sandy-coloured birds looking quite different to the north European birds. Two Short-eared Owls also showed well here as did a Western Grasshopper-warbler. A Black-winged Pratincole colony was our next stop and we had excellent views of these birds, both on the ground and in flight and nearby we added Caspian Tern to the list. Next was a key species for any trip here, near a village we scanned the short grass and quickly located a flock 11 Sociable Lapwings, a rare and declining species these days. We were treated to wonderful views of these enigmatic birds and later found two more bringing our total to an impressive 13. A stop at another area small bushy area provided us with some nice birds: Bluethroat, Siberian Stonechat, Paddyfield Warbler and our target species, Booted Warbler with two seen incredibly closely. Other stops at various lakes during the day produced many of the same birds but of particular note were 173 Whooper Swans, 200+ Greylag Geese, 93 Red-crested Pochards, 52 Garganey and 150 Caspian Terns. Our first day on the steppe had been highly successful and today there was no pressure today to find any target species. We just enjoyed our birding. We firstly birded the local area enjoying the Bluethroats that were nesting around the huts in which we were staying, finding more Savi's Warblers and Bearded Parrotbills and admiring breeding-plumaged Black-throated Divers. After lunch, we drove to a different lake in search of Greater Flamingo. Here we found 13 Pied Avocets, 115 Curlew Sandpipers, 300+ Slender-billed Gulls, 100+ Red-necked Phalaropes and 27 Greater Flamingoes. Two stunning male Pallid Harriers and a few Twite were seen en-route but the real excitement was a torrential thunderstorm which nearly resulted in us becoming stuck in the mud! Finally, it was time to drive back to Astana for the flight back to Almaty. 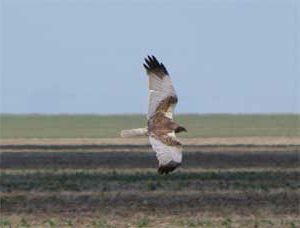 We stopped at various sites seeing birds such as Merlin, Steppe Eagle and Demoiselle Cranes for the last time and enjoying stunning views of both Western Marsh-harrier and Pallid Harriers hunting and five Red-footed Falcons – two adult males, two young males and a female. Near Astana we added Yellowhammer to the list and saw our first European Bee-eater for a few days. Arriving back in Almaty we transferred back to our hotel again before an early next-day departure back to the UK.